Polybloggimous: Science Fiction Movies Always Get It Wrong. You know how the aliens, or alien robots, or alien cyborg robots, or clones, or alien cyborg clone monster robots (or alien clone monster robot dogs with bees in their mouth so when they bark they shoot bees at their enemies), always show up and the first thing they say is, "Take me to your leaders."? How stupid is that? When I show up on some alien planet, I'm gonna say, "Take me to your followers"! Once I get those simps obeying me, the leaders won't be able to resist! 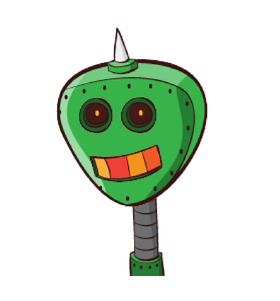 With that in mind, I invite you to visit RoboHash to create your own awesome Robot Representative for when you decide to colonize the galaxy. When they shoot at your Robot Representative -- or chew on him or spit corrosive acid or whatever -- you'll still be sitting comfortably behind the scenes ready to execute Plan B. Here's the Representative they generated for me. His genial appearance will surely lull my enemies into a false sense of security and then BAM! Take me to your beer! Small alien on meeting 1950s era Sophia Loren: "Take me to your ladder, Lady, I'll meet your leader later." I spent the whole week asking everybody I saw if they remember and know the name of the movie with the line "there I was, there I was, there I was, in the Congo(?)" said by an intense guy. Please tell me you know what I'm talking about! It didn't ring a bell, but Google is your friend, filelalaine! BTW, I'm pretty sure the last guy in that spot is Peter Onorati, a guy I worked with very early in my fledgling career. No wonder I couldn't remember the plot of the movie... it wasn't a movie, doh!